SIZE: 3 Beds | 2.5 Baths | 1,681 Sq. Ft. WHEN: Sunday Feb 10th, 12-1 p.m.
About: A luminous corner condo set within the first building in NYC to attain LEED Platinum certification, this 3-bedroom, 2.5-bathroom home boasts pristine finishes and incredible views of the Hudson River and Statue of Liberty. Features of the apartment include gorgeous hardwood floors, huge windows with eastern and southern exposure, central heating and cooling, and a convenient in-unit washer/dryer. SIZE: 5 Bed | 5 Bath | 3,090 Sq. Ft.
About: The home is a three story, two family property completed with luxury finishes and outdoor space. 220 7th Street, Gowanus, a stately designed and re-imagined two-family, three-story brick townhouse that has been completely gut-renovated with impeccable execution & style that appeals to today’s modern lifestyle. Graciously configured as an owner’s triplex featuring 3 bedrooms (potential of a 4th), 4 bathrooms, a privatized garden & finished basement while still providing a separate studio garden apartment perfectly suited as a guest home, nanny suite or additional rental income unit. This IPad controlled smart-home sets your level of expectations upon entry to your parlor floor where you are welcomed by an open but distinct dining, kitchen & living quarters drenched in exposed brick detail & elegant select white oak chevron floors that establish the warmth you need to call home. A state-of-the-art chef’s kitchen immediately becomes the epicenter of your floor highlighted by an 8’ Calacatta marble waterfall island & backsplash accompanied by creamy white inset custom cabinetry, six-burner Wolf range/stove, custom vented hood, sleek paneled Sub-Zero refrigerator, Bosch dishwasher & wet bar with wine cooler. The second floor offers your sleeping oasis with two sprawling bedrooms and an ample amount of closet space, along with a cozier skylit third bedroom perfectly suited as a nursery or home office. The garden-facing master suite spans the full width of the house with his/her walk-in closets and jaw-dropping bathroom dressed in chic statuary Italian marble, herringbone tiled floors, eye-popping brass fixtures, Restoration Hardware dual vanity & spa-style shower fixtures. About: Over-sized windows and 11 foot ceiling height with crown moldings introduce special appeal to this impressively neat and comfortable one bedroom home. A graceful decorative stone Carrara marble mantle fireplace anchors the living room. A space saving in-wall/masonry sleeve air conditioning unit cools the home when needed. There is excellent storage, consisting of recessed medicine cabinet, and built-in bedroom closet/shelving.. Two more closets and three built-in cabinets provide ample space. SIZE: 2 Bed | 2 Bath | 1,250 Sq. Ft.
About: Situated in the historic Fitzroy Townhouse complex, this hard-to-find property is truly an architectural masterwork. The moment you enter you are struck by the breathtaking centerpiece of this home -- a lush, two-level, 44' x 25' south-facing garden with the most extraordinary trees, bushes and plantings -- and you are immediately transported from the city into the country! This enchanting, 1100 s/f outdoor space is a gardener's delight. It was recently completely redesigned and replanted, and features several seating areas, dining for eight under a gorgeous pergola with buffet, potting sheds/outdoor storage and even a gas fire pit to keep you warm on a cool evening. Renovated by a well-known designer, this unique home seamlessly combines original detail with a modern aesthetic. The living room with its double height, 17' ceiling gives the feeling of loft living as abundant light streams in through two stories of south-facing windows. Smartly laid out with one bedroom and bath on each level, the apartment features an open Chef's kitchen, gorgeous white marble floors on the lower level and rich hardwood upstairs, a wood-burning fireplace, multiple built-ins, truly amazing closet and storage space, through wall temperature controlled A/C and a vented washer/dryer. The all-new Chef's kitchen features top-of-line appliances, with two Miele steam/convection built-in wall ovens, a vented Miele four-burner range top, Miele built-in 30' fridge, Miele dishwasher, and gorgeous white Caesarstone counter tops. Everywhere you look in this home, there is thoughtfully designed storage space. The top level features a spacious bedroom, walls of closets, full bath and a versatile open den/office area. The enormous master bath is a dream come true, with stunning hand-cut Italian glass tiles, double sinks, a Toto Neorest toilet/bidet, phenomenal storage and an over-sized tub. SIZE: 6 Bed | 4.5 Bath | 3,500 Sq. 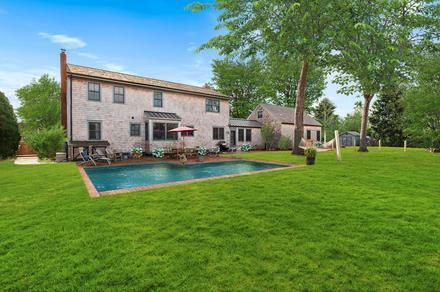 Ft.
About: A beautiful North Haven house designed with Sag Harbor Captain homes in mind. Three +/- blocks away from beach with endless sunsets. Minutes away from Sag Harbor village and bordering on almost 30 acres of nature reserve with trails. Situated on lush 0.57 +/- acres of English garden design by renowned landscape designer with heated pool, stone patios, heated outdoor shower, greenhouse and treehouse. Spacious living room with wood burning fireplace, 6 bedrooms , 4 bathrooms, eat-in kitchen, bonus loft room, additional entertaining space or work space with wet bar. Master suite has walk-in closet and dressing room, authentic clawfoot bathtub and spa shower. Junior master on first floor. Mudroom / breeze way leads to bonus space. Finished basement. All new appliances, designer hurricane-grade windows, efficiency water heater and Buderus clean-burning boiler. Rambling, comfortable and located in the best of all worlds.